My mom sent my boyfriend and I home with TWO bags of turkey and a coffee carafe filled with turkey soup. So for the last week for both lunch and dinner I've eaten nothing but turkey. Turkey sandwiches, turkey soup, turkey pot pie, just plain turkey, and more turkey sandwiches. My boyfriend loves it. He could eat cold turkey all day everyday. I can not. So this afternoon after yet another turkey sandwich, I convinced my boyfriend we needed something else for dinner. Spice things up if you know what I mean.... w/ Spicy Mexican Muffin Pan Tacos! OLA! 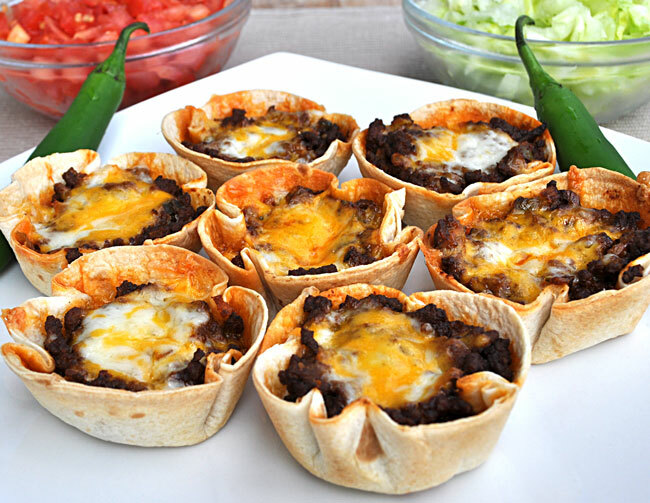 Muffin Pan Tacos... some people are just so darn smart! 1. Preheat oven to 350f. Cook the ground hamburger thoroughly, drain and return to a clean skillet. 2. In a separate skillet, saute the diced onion and jalapeno and add it to the hamburger. 3. Blend in the seasoning and toss to coat. 4. Heat the mixture on high and add water; reduce and let simmer on med/low for about 10 minutes. Stir occasionally to prevent sticking. 6. Wrap tortilla circles - 3-4 at a time - in a wet paper towel and microwave for 30 seconds to soften. 7. Mold the circles into a lightly greased muffin tin. 8. Add a layer of shredded cheese in the bottom, add about 2 tablespoons of meat mixture, then top with cheese. 9. Bake for 20 minutes. When they're done, just pop them out and add your favorite toppings! 10. Eat 6 and give 6 to your boyfriend (or girlfriend or roommate)! Yum! Those look great. I'm a new follower. What a great blog! I just stumbled myself. That's so cool. I think I found a recipe that I can make, and my husband will actually eat it. Since everything is basically optional - say for the meat and shell - I can make 6 I like, and 6 he likes and we're both happy. I found your recipe on pinterest and wanted to let you know that I made it tonight and loved it! I used a jumbo muffin pan, so the whole tortilla fit without cutting it. I also used black beans instead of meat. It was so good and super easy that I know it'll become an old standby. Thanks so much! You can buy small size tortillas, snack size! Ask you grocer to order-Guerrero brand, no cutting needed. I love this blog. :) thanks for the recipe! Or you can just make 4 inch flour tortillas ;) This is the recipe I use http://whatscookingamerica.net/CynthiaPineda/Tortilla/TortillaMaking.htm but you'd probably need to half it, or just save the rest of your tortillas for another day. All you need is flour, shortening (or coconut oil or lard), baking powder, salt and water - so easy!